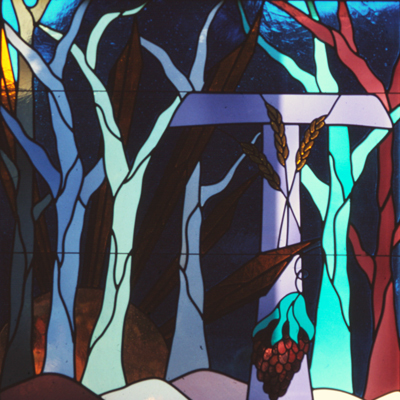 ​The windows at Church of the Holy Spirit are inspired by depictions of the Holy Spirit throughout the Old and New Testament. The biblical activity and description of the Spirit is rich with symbol, sign and metaphor. 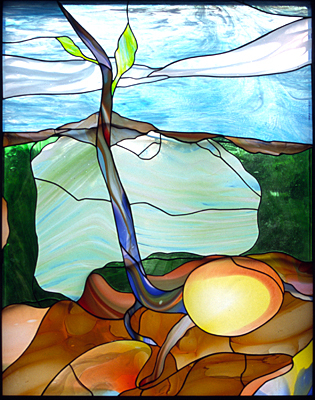 The windows maintain an integrity with the biblical record and are necessarily non-referential and abstract. They are designed to provoke rather than instruct. 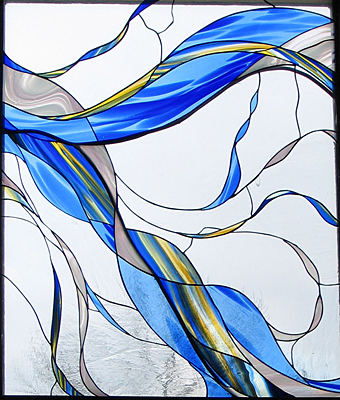 The windows invite the viewer to explore the possibilities and meanings of the nature and person of the Holy Spirit. 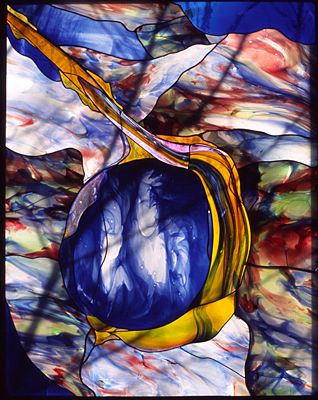 The Lambert glass used in the windows is hand-blown material from Germany, each piece unique and irreproducible using raw elements such as gold and silver. 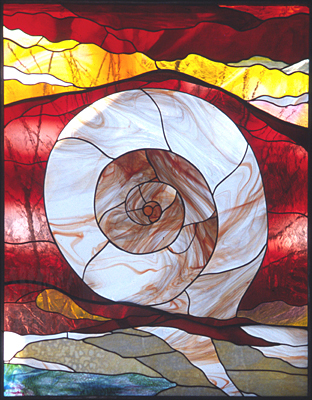 The material blends multiple colors and opacities enabling larger piecework, and supporting a water-colored appearance inspired by Georgia O'Keefe. 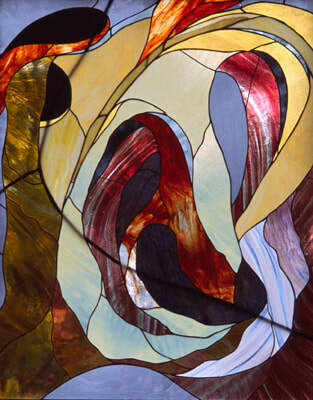 Each window has been designed as much by the nature of the glass as by the intention of the artists. 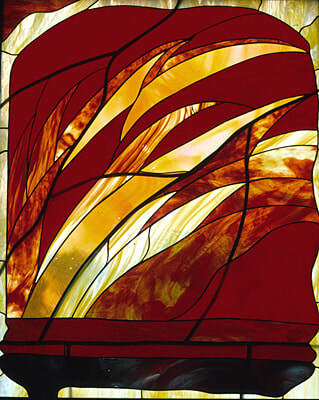 In the same way, the welded framework has been created to support the free flowing medium of the glass. There are no horizontal or vertical bars which are typically added to support the weight of the glass and preventing bulging and cracking. The strengthening supports have been manufactured so as not to disrupt the flow of design. You are invited to see and reflect upon the movement of the Spirit in your own life. 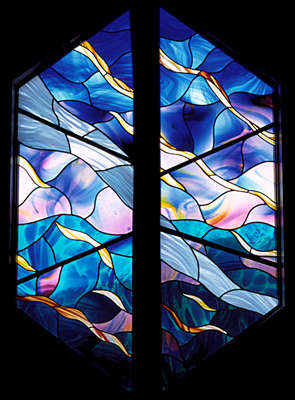 Lord God, the whole world is filled with the radiance of your glory: Accept our offering of these windows which we dedicate to you for the adornment of this place and the inspiration of your people. Grant that as the light shines through it in many colors, so our lives may show forth the beauty of your manifold gifts of grace; through Jesus Christ our Lord. Amen. The two hexagonal windows were begun by John Keegan of John Keegan and Company, Bucks County, Pa., who passed away before work could be initiated on Resurrection which was designed by Philip Carr-Jones and fabricated by John's workers before disbanding. The ten nave windows depict principal biblical scenes of the Holy Spirit. 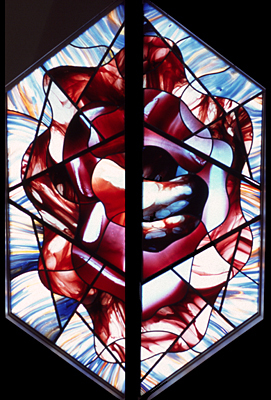 The southern windows have been accomplished first and use deeper colored glass given their location. The awning sections of all the windows remain clear, flooding the lower areas of the nave with natural light. The western windows are translucent, allowing the exterior horizon to inform the space and balance the light on Sunday mornings. 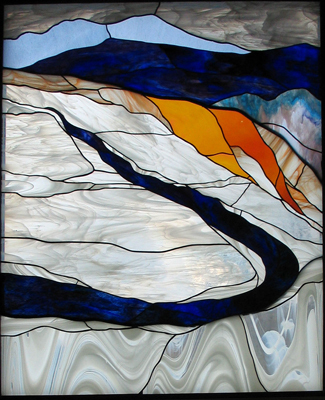 The designs have been influenced by the Canyon Suite water color paintings of Georgia O'Keefe (1887-1986). 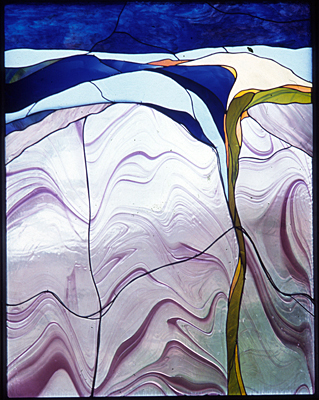 For the southern windows, David Scott and Philip Carr-Jones created the patterns and selected glass with designer and fabricator James Shettino, Out of Hand Studio, Lebanon, NJ. Breathe was designed by Ruth Tiejin Councell and Jim Shettino. 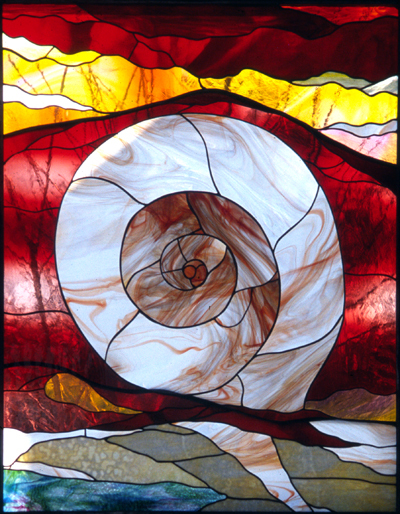 Other windows have been a collaboration between Jim (glass and design) and Philip (welding and design). The descriptions are presented in biblical order. Given in thanksgiving for our family by Wendy and Mark Smale. In those days Jesus came from Nazareth of Galilee and was baptized John in the Jordan. And just as he was coming up out of the water, by he saw the heavens torn apart and the Spirit descending like a dove on him. And a voice came from heaven, "You are my Son the Beloved; with you I am well pleased. ( Mark 1:9-11). The principal symbol in the Narthex is the Dove, carved by Biguel Fall, Dakar Senegal. This is our parish's primary symbol of the Holy Spirit. The Dove is the first and main symbol which greets the visitor to our community. It is a gift by Mr. Fall in gratitude for our support of his community carpentry shop over the years. Mr. Fall is responsible for all the church furnishings, including the Ambo, Altar, platforms, Nave Cross, Holy Oil, Parish Icon Holder and Aumbry, as well as the pews! He is also the creator of the Christus Rex. Both the Dove and Christus are made from single piece African rosewood. 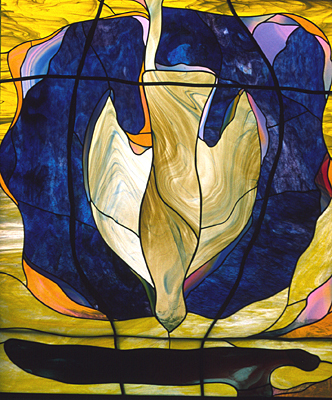 On either side of the Dove are two distinctive windows made by Jim Shittino. Both the bright rising sun and moon with its ring of glory express the enduring and infinite reality of who God was, is, and ever will be. 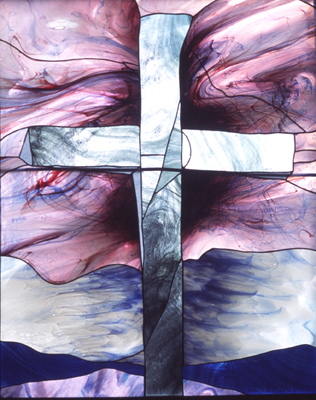 The Tau window was designed by John Keegan and expresses three main elements of the Christian faith: the Scriptures, the Sacrament and the Cross. The shape of the cross is in the form of the Greek letter tau and is most likely the shape of the historic instrument of Christ's crucifixion.